Snow time! With this new Forest Deer Night Lamp. This Handmade night light will add happiness and magical atmosphere to your child's/baby room and will spark their imagination. The comforting Miniature Scene in this enchanting decorative night lamp will help your little one drift into a calm and relaxing sleep this beautiful handmade Tabletop Warm White Micro LED light is operated by 2 AA batteries (Batteries not included). The Micro LED inside do not emit heat and is perfectly safe for use in your nursery and kids bedroom. Since it's all handmade actual product may vary slightly from its reference photo. This item is not a toy, keep away from children. Comes in an exclusive open window Gift Box. Made in Israel! APPEARANCE: Miniature scene in a small, high quality Glass Jar, Beautiful and lovely. Not only can be used as night light but also be used as a Nursery decorative item. Comes in an exclusive open window gift box. 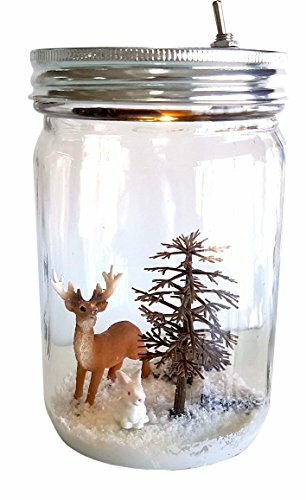 SAFETY: This unique LED Christmas Edition Forest Deer night light does not emit any heat and is perfectly safe for use in your nursery, baby, and kid's bedroom. EASY TO USE: No need for electrical outlet or charging. This beautiful handmade Night Light' is operated by 2 AA batteries with a 30 minutes shut off timer. More than 2 months running on same batteries in normal use. WARRANTY: If there any issue about this product, please feel free to contact us first, we will give the best solution at the first time.